I love a roast chicken because it’s delicious, you can cook a whole meat in one dish, and you get to make soup out of the bones. 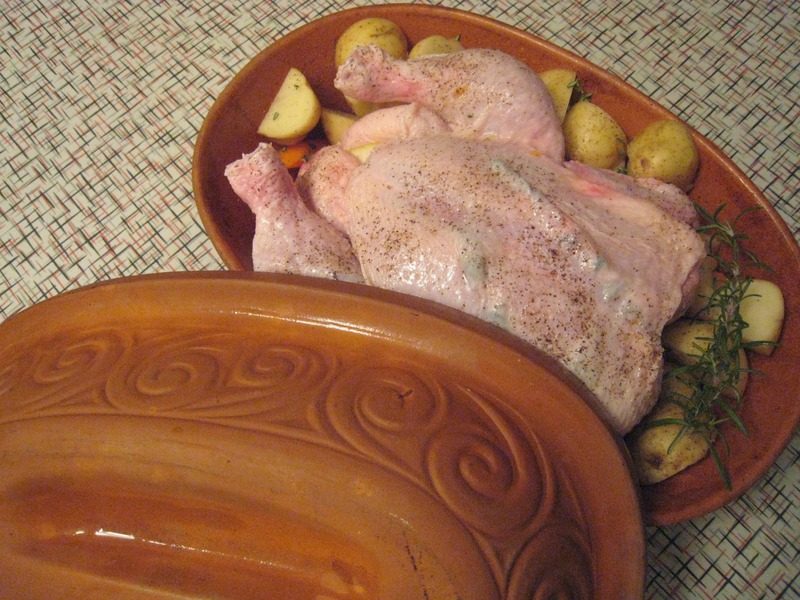 I have a Romertopf clay baker, but had never used it for cooking a chicken – if you don’t have one, you can use any other covered dish that fits a chicken and all these veggies. I found this to be a great dish to make for company, because I could throw it in the oven an hour before anyone came over, and then I had time to do some of the last minute jobs, such as relaxing a bit. 1. Immerse the Romertopf in water for 15-30 minutes. This needs to be done to avoid cracking when it is in the oven. 2. Cut up all the veggies and place them in the bottom of the roaster. I also placed some around the sides of the chicken. 3. Run your fingers between the skin and breast of the chicken to loosen the skin up. Push a few springs of thyme under the skin. Rub the chicken with a little butter or olive oil. Place it, breast side up, in the roaster. Stick the lemon whole or cut in half into the cavity of the chicken. Salt and pepper the chicken and veggies liberally, and add a few splashes of wine. Add some more thyme on top of the veggies. I also put in a rosemary branch. Put the lid on top of the baking dish. 4. Place the Romertopf baker in a cold oven, then turn it up to 400F. If you are using another type of baker, feel free to preheat the oven. Let the chicken bake for 1 & 1/2 hours. I didn’t even peek at mine, hoping for the best, and it turned out perfect. Mine browned with the lid on, but if you find yours is still a little pale, feel free to pop it back in the oven for a few minutes. 5. Let the chicken rest for about 20 minutes with the lid on before carving it. There was quite a bit of liquid in the bottom of the baking dish, so I pulled the chicken out and drained it. Because the chicken is literally ‘falling off the bone,’ it was a little difficult to take it out whole, so you could use a turkey baster to remove the liquid. See this link for chicken broth. You can use the bones and skin instead of the chicken pieces the recipe calls for. If you didn’t make gravy with it, you could also add the juices that were drained off. 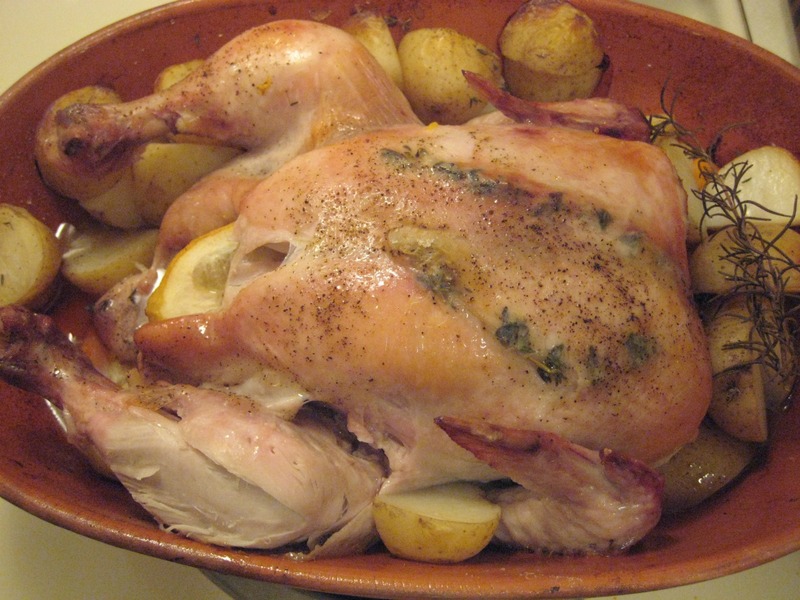 This is my go-to recipe for clay cooker chicken now. I inherited a clay cooker when a friend moved, and I had never used one before. The sweet potato and garlic BULB are I think the key ingredients that make this awesome. Thanks for posting this! You are so welcome! I’m glad to hear the recipe is working for you! It turns out really moist and delicious!